MOTHER and daughter Irene and Val Buchanan know the power of family. The almost inseparable pair have lived out their golden years in the comfort of their Geebung home for the past 33 years. 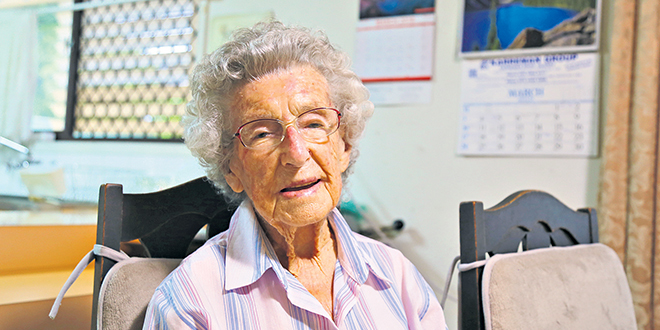 “Mum’s 105 and still in her own home,” Val said, sitting across from her mum at their dining room table after sharing a cup of tea. The walls and shelves of their home were filled with mementos and photographs of family and friends. Val, 75, contracted polio when she was a child in 1951, which she said was still considered part of the 1950 epidemic. She looks after her Mum, who was unable to live by herself, but time was catching up to Val too. “If it weren’t for Val, I would be in a home,” Irene said. But Val said she was starting to wear out a bit too. “When you get older it catches up with everybody, but with a polio person it catches up when you’re younger – it’s starting to rear its ugly head again,” Val said. It was also simple things like paying the bills that became difficult – if ever Val had to leave the house, it was a risk. But recently the pair began to access a 4-hour weekly flexible respite program provided by Centacare, which sends out a support worker to take care of Irene and free up Val to do whatever she needs or wants to do. Centacare has been part of their life for many years now and worked with Val and Irene to gain access to the support they need. “(Centacare) have one day a week where they send someone out to be with me while Val has about four hours and she can do what she likes on that day,” Irene said. Other than watching Irene and giving Val the time to go out to pay the bills and do her own things, the Centacare support worker also helps around the house – including hanging out the washing and changing the beds. Val said she could get the clothes into the washing machine “not too bad”, but it was hanging the clothes up while they were heavy and wet that was difficult. “It’s a wonderful help doing the washing,” she said. “But this lady herself came up with the idea, what if she did the washing and put it out and make the beds up – and mum loves her coming. While the respite time made it easier and alleviated some of the daily pressure, it was the backing of close family that helped the pair stick together in their home, Val said. “You’ve got to have backing by family,” she said. The mother and daughter pair are evidence of the strength of family bonds. But Val’s brother helps the pair too; he sometimes gets groceries for her and helps out with things beyond the home. The retiree across the road, “a really good man” was only a phone call away too. “It’s all these things that keep you in your own home,” Val said. She also said it was “really important” that people planned for their future. “I stress that … from fifty on, you’ve got to start and think of your retirement years,” she said. “I just notice that quite a lot of that age group that come out with their superannuation and they’re overseas, here there and everywhere. And Irene and Val still have some future planning too. Val said Irene’s great grandson rang up this year and said, “Grandma, you’ve got to live until you’re 106 because I’m getting married the day before”. Val told her mum, “So there you go, you’ve got to live until 106”.